If pictures of lions and tigers have all but vanished from your Tinder deck, you can tweet out a hearty #thankscuomo. One of New York Governor Andrew Cuomo's legal moves this year was a ban on taking selfies with big, dangerous cats, which was had apparently been the best strategy dudes thought of for attracting women on Tinder. As New York Magazine wrote earlier this year about the Tigers-on-Tinder phenomenon, "Tigers have long been a kind of totem for sexual prowess and brute aggression. 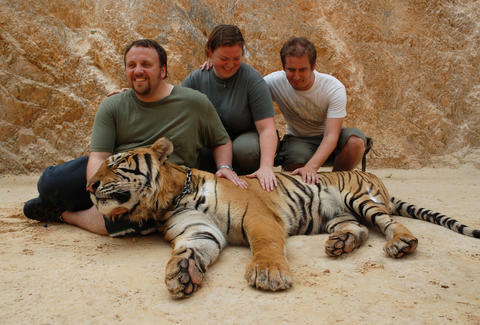 Posing near one lets potential lovers know, Hey, I'm an adventurous guy, but not too adventurous, just, like, enough so I have only one good story about the time I went to India/Thailand/China/San Diego and posed next to a tiger." But, if a cheetah hits up a county fair and no one gets a selfie, does it really exist? -And finally, Ferrets are legal! (What this city definitely needs is more weasels.) This is why voting matters. Hannah Serena Goldstein is one of Thrillist’s editorial assistants. She didn’t vote this November, but that’s because she’s waiting to get a New York ID until it comes with zoo admission. Follow her on Twitter and Instagram.